In a historic move, VA Secretary David Shulkin testified before the House Veterans Affairs Committee on March 7, 2017, that he intends to open up urgent mental health care to former service members with Other Than Honorable (OTH) discharges who are in crisis. This is the first time that an initiative which is focused on providing mental health assistance to OTH service members has been put into place by a VA Secretary. VA officials emphasize that veterans’ mental health issues are a significant concern. Of those 20, roughly 14 are not enrolled in VA healthcare. Many of those are combat veterans who received their OTH discharges because of misconduct related to a traumatic brain injury or PTSD, making them ineligible for VA healthcare. Secretary Shulkin will be meeting with DoD officials, Congress, and Veterans Service Organizations to figure out the best ways to get help to former service members with OTH discharges. As part of the proposed plan, OTH service members will be able to receive treatment at a Vet Center, a VA Emergency Room, or by calling the Veterans Crisis Line. As part of their ongoing efforts to treat veterans in mental health crisis, the VA has made significant changes to the Veterans Crisis Line, adding new counselors, opening new facilities, and improving response time. 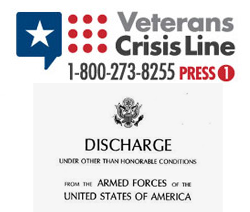 The Veterans Crisis Line is a valuable, effective resource for those who are struggling. In addition, the VA has implemented programs such as #BeThere and REACH VET (seeour article from September 6, 2016 for more information) to help people reach out and help identify veterans who may be in crisis. The resources listed below are available to ANY veteran or service member. You do NOT need to be registered or enrolled with the VA to use these services.